Ok, V.C. Andrews fans. We've been waiting for decades to see Petals on the Wind adapted for the screen. So how does Lifetime's TV movie measure up? I've seen it, and I'm going to be as honest as possible with you here: there's good news and there's not-so-good news. We'll start with the latter. If you thought the Flowers in the Attic Lifetime adaptation would've been better as a miniseries, with a bit more time to really dig into V.C. Andrews haunting and emotional story, expect to feel similarly toward Petals on the Wind. On the bright side, as was the case with the new adaptation of Flowers in the Attic, Petals on the Wind does make a strong effort to capture the source material. If you were to make a timeline of major events within the second novel of V.C. Andrews' Dollanganger series, you'll find that many of the key moments (or versions of them) do make it into the TV movie. But the pacing is rushed and jerky, and the jump forward doesn't allow us much time to re-immerse ourselves into the story or get to know these characters ten years after the events of Flowers in the Attic. If it hasn't been made apparent already, this article isn't intended to be a traditional review of Lifetime's Petals on the Wind. Consider it more of a book-to-screen analysis of the TV movie, intended mainly for those who've read V.C. Andrews' Dollanganger series, and specifically, the second book in the series, Petals on the Wind. It contains some references to the plot of the book, but no major spoilers. This is my reaction as a fan of the book, to fans of the book. If you're only looking for vague, general impressions, read the intro above and skip to the verdict. I'm not going to nitpick all of the little changes that were made from the book to the screen, but there were a few notable adjustments to the story for the movie. Petals on the Wind follows up on Lifetime's Flowers in the Attic TV movie, which told the story of four siblings forced to live in a secluded bedroom of a grand mansion for years while their widowed mother attempts to regain a place in her father's will. Lifetime's new TV movie jumps ahead to 1970, when Cathy is on the verge of pursuing a career as a dancer. 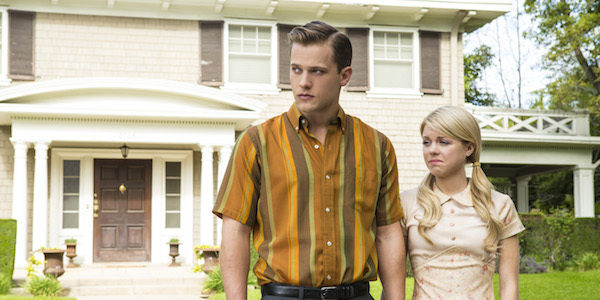 Chris (Wyatt Nash) is a third year med student. And Carrie (Bailey Buntain) is attending a prestigious prep school. In the book, the story picks up almost exactly where Flowers in the Attic left off. Fresh from their escape from Foxworth Hall, the three runaway siblings are rescued by Henny, a kindly housekeeper who encounters them on a bus and takes them to her "doctor-son" boss Paul Sheffield, who becomes a father-figure to all of them, a mentor to Chris, and a love interest to Cathy. Yes, he's way too old for her, but let's face it, it's hardly the most inappropriate romance in Cathy's life. Lifetime's movie acknowledges that Paul took them in, but he is barely -- and I mean very barely -- seen, as the jump forward essentially eliminates him from the equation. Given the short amount of time that this movie has to tell its story, it's an understandable omission. So the jump forward is a big change from the book, as is the omission of one key romance from the source material. While Paul is worked out of the story, a romance for Chris is worked in, adding a bit off drama to his side of things, as Cathy pursues her career in dance and attempts to distance herself from her brother romantically. Carrie, meanwhile suffers as a social outcast at school. Having spent too many years away from the sun and a healthy childhood, she's smaller than average and is called a freak by her peers. The attic haunts all of the Dollanganger siblings in the years that follow their escape, while their mother, Corrine, happily enjoys her inheritance and her marriage to Bart Winslow. She's pretending she never had kids, and is busying herself making plans to renovate Foxworth Hall. The Grandmother, meanwhile, is bedridden from a stroke, but is lucid enough to try to cause problems for Corrine as it relates to her secret past. 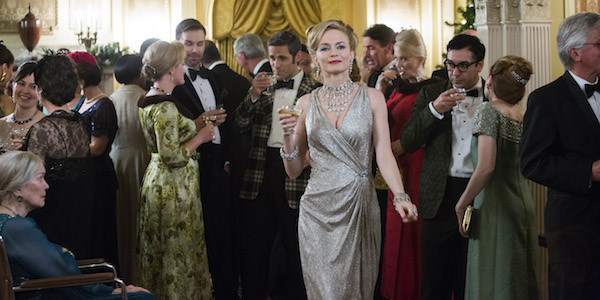 Returning to her role as Corrine, Heather Graham seems to fit into the part much better this time around, likely due to some changes in the way Corrine's presented. No longer is she hesitant and full of excuses, as she was in Flowers in the Attic. In Petals on the Wind, Corrine seems to be embracing her new life and the power that comes with being an heiress. Her disdain for her mother is also far more apparent, and that almost makes Olivia seem sympathetic, especially when taking into account the Grandmother's bedridden state. Ellen Burstyn still steals every scene she's in, but Graham's performance works better in Petals on the Wind than it did in Flowers in the Attic. With the jump forward in time, the parts of Chris, Cathy and Carrie understandably had to be recast with older actors. As Cathy, Rose McIver steps into the role nicely, capturing the many faces of Cathy, who is sometimes loving and innocent, sometimes vengeful, and always beautiful, not to mention a dancer. That last part is demonstrated well enough when she gets involved with the volatile Julian (Will Kemp). Cathy is also wise beyond her years and angry enough to do whatever it takes to pay her mother back for the years of suffering she and her siblings endured. I don't think the movie fully captures the scope of Cathy's rage, but the fact that Graham plays up Corrine's unlikable side in this adaptation certainly helps in allowing us to appreciate Cathy's efforts to take her down, regardless. Bailey Buntain plays the sweet and vulnerable Carrie well, and the casting really is perfect here, as she looks so much like her character's sister, and Buntain brings the right amount of lovability and vulnerability to the youngest Dollanganger sibling. Wyatt Nash's Chris comes off a little awkward at first, but he shifts into the role of the rising star doctor in training, who's trying to move forward in his life, despite the unhealthy level of affection he feels for his sister. Petals on the Wind's pacing is really where the adaptation falters. Referencing the mentioned timeline of events from the book, it almost feels like the movie seeks to check off as many boxes as it can. And on one hand, as fans of the book, we might appreciate that a lot more than if the movie had rewritten the story almost completely in an effort to fit a good stretch of drama into a two-hour time frame. By the book's pace, a two-hour movie probably could have focused entirely on Cathy's move to Virginia for the final stages of her grand plan of revenge. Including Cathy's relationship with Julian, along with Chris and Carrie's part of the story, there just isn't enough time to fully explore anything beyond its relevance to the chain of events. In order to fit most of the key events into the story, the film has to jump from one to the next without much build up. What's lost is the depth that Cathy's narration offers in Andrews' book. We don't get to appreciate Julian as the tortured and frustrated dancer that he is in the book, at least not at the level Andrews presents in her novel. In Lifetime's movie, Julian comes off as a man with a lot of mood swings and abusive tendencies. It's hard to understand why Cathy wants to be with him in the first place. Also missing from this adaptation is that slow boil that builds inside Cathy throughout the novel, allowing us to watch in rapt anticipation and even sometimes apprehension as Cathy unleashes her anger on the people who hurt her. And we aren't really brought into a full understanding of why Chris and Cathy are so drawn to one another, beyond the general knowledge of the abuse they endured during their adolescence. The effects their attic years have had are demonstrated, but there isn't enough time for the movie to delve deeply into what Chris and Cathy are trying to deal with and why they feel the way they do. That may be as much the result of the jump forward as it is the crunched time for this movie. We don't get much sense at all of what the last decade has been like for them, so we just have to assume they've been harboring guilt, pain and frustration all these years. As a fan of the books, I can accept the changes that needed to be made to condense the story, and I can definitely appreciate the efforts Lifetime's Petals on the Wind takes to remain true to the book as it relates to some of the major events that transpire. Honoring the source material seems like it was a high priority here. But with the time constraints of a TV movie, Petals on the Wind isn't able to dig much deeper than the surface, which is kind of a problem when we consider just how dramatic the story is to begin with. Understanding character motives is key to the emotional connection readers have with the book. That connection doesn't really happen here, which may limit the level of satisfaction diehard fans of the book have with this adaptation. At its core, Andrews' Petals on the Wind is really a story of revenge, told to us from the perspective of Cathy as she goes through adolescence and becomes an adult, striving to reach her goal of being a prima ballerina, but haunted by the damage done to her by her mother. Her feelings toward Corrine border on obsession in the book, serving up a mixture of rage and idolization, which makes for a venomous concoction of emotions. Cathy takes all of the pain, guilt and frustration she and her siblings have experienced since their father died and aims it at her mother. She conspires to undo everything Corrine worked for. On paper, Lifetime's Petals on the Wind manages to follow that basic course, and it gets the casting right, which is another positive to note. The timeline of many of the the book's events remains intact, which fans should appreciate. But in order to really explore the emotions each of the characters were experiencing throughout this part of their story, this adaptation would've worked better as a miniseries or a limited series. As a movie, it falls a bit short. But fans of the book should still take a look when Petals on the Wind premieres Monday, May 26 on Lifetime.